It is said that you have really made it when you are mentioned in Private Eye – even better by Piloti. 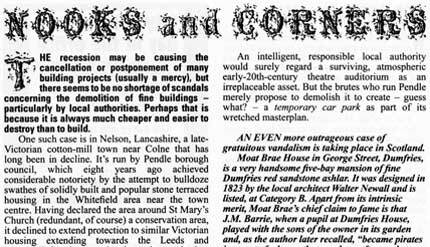 WMUD received that dubious honour in Private Eye No 1243, September 2009 with a credit in Nooks and Corners for some master planning work we allegedly carried out in the town of Nelson, Lancashire. We certainly tendered for a master planning job in Nelson for Pendle Borough Council but we didn’t win it – I recall that BDP were awarded the contract. 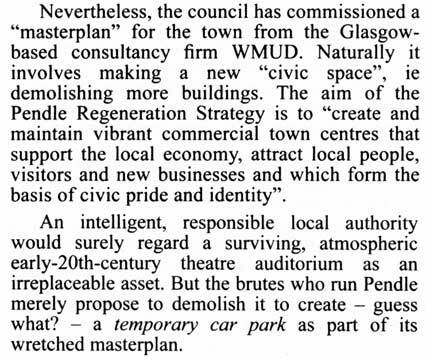 The only time we worked there was in 2002, producing a range of proposals through extensive community involvement for the Grand Cinema site which had been cleared following the destruction of that building by fire some years before. So our work is quite unrelated to Piloti’s rant about the Palace Theatre. So Gavin Stamp, if you are still Piloti, thanks for the great publicity but you have this wrong as far as our involvement is concerned. Nevertheless there is a core of truth in your article about the state of regeneration and conservation practice in the UK and we look forward to more from you. Whether we will believe it or not is another matter.